Notorious con artist and forger Neal Caffrey has been caught again after escaping from a high-security prison with only months to go on his sentence. Caught, no less, by FBI agent Peter Burke, the only one who has ever been able to get in Neal’s head and track him down. Now, Neal has talked Peter into making a deal, letting him out of prison on an ankle tracker for having him help Peter on his cases. An insider’s view, if you will. And although trust between them comes at a premium for a while, these two unlikely partners quickly develop a close working relationship and one of the highest close rates in the bureau. White Collar is one of those shows that I would have (did, actually) write off as another of those boring police procedural shows–probably still wouldn’t have watched it if it weren’t for some awesome fanfic writers who love other shows that I enjoy also writing fic for this one. And I am so glad that I decided to give it a try. (And not just because Matt Bomer’s gorgeous, although yes, he is that.) Seriously, the show manages to be smart and funny and angsty and full of the best sort of bromance. It wrestles with issues like trust and true friendship. The characters grow and develop over the course of the show. And they’re pretty awesome right from the start, whether you’re talking about Neal’s suave, smart, sharp-dressed culture or Peter’s baseball-loving, down-home feel that will surprise you with moments of absolute brilliance or Mozzie’s conspiracy theories and undying friendship or Elizabeth’s warmth and insight. I can honestly say that I fell in love with these characters within the first episode, and that love only grew with time. The bromance between Neal and Peter warms my heart, the way they pick at each other incessantly, yet have each others backs when it counts, the adorable little-boy smiles they get when they’re together. It’s fabulous and heartwarming. The individual episode plots are more your standard procedural stuff, but they manage to be smart and interesting, allowing the characters’ individual traits to shine and grow, while also mixing in bigger long-term plot elements in the midst of each individual episode’s plot. I would highly recommend White Collar, and not just to those who like police shows, but to those who enjoy intrigue, great characters, bromance, angst, high-class suits, and guys who look great in them. Shawn and Gus’s friendly visit to New York has gone dangerously off the tracks, and Gus finds himself teaming up with FBI agent Peter Burke in an attempt to find Shawn who has disappeared along with Peter’s CI, Neal Caffrey. Meanwhile, Neal and Shawn find themselves kidnapped, waking in a strange place and searching for a way of escape. And back in Santa Barbara, the gang are also placed on alert as they find their resident psychic has been kidnapped and is currently missing. . . . And is this even really just a kidnapping, or is it part of some grander scheme? I really enjoyed DTS’s story Psychic in the City, but as I mentioned in my review of that, it leaves us on this major cliffie. (White) Collar Optional brings us in right where that story cuts off–you might even consider them two pieces of one story, only this second part leaves New York pretty quickly. The things I loved about Psychic in the City are here in spades–the fabulous crossover, the great writing, the interesting and fun combination of character interactions and bigger plotlines. But this story feels more mature, more developed. It actually handles the things I had minor issues with in the previous story, drawing out the characters’ individual quirks more and also discussing more how Shawn and Neal’s relationship actually works. And I have to say, their hijinks here are pretty amusing. It’s also fun to see the SBPD group get in on the action here. The one area I got tripped up on in this story (and this may totally just be my being stupid and slow) but the whole big plot of showing up Shawn as a fake got kind of convoluted and weird in my mind. . . . But I enjoyed the story as it occurred anyway, and I found the individual characterizations and their interactions to be more than enough to make up for any plot confusion I felt. I would definitely recommend (White) Collar Optional, although please read Psychic in the City first; this is one of those stories where the sequel really needs to be a sequel and is not a standalone story. Note: You can find (White) Collar Optional at https://www.fanfiction.net/s/10367570/1/White-Collar-Optional. Shawn Spencer and Neal Caffrey first met in a museum in Chicago when they were both still just teenagers, striking up an unusual but lasting friendship. Nearly a decade later, Shawn finds himself in New York, pulled into the FBI’s White Collar division as a consultant in the search for an international art thief, forger, and con man–only to quickly discover that the man in question is his old friend, at which point, Shawn quickly removes himself from the case. Years later, Shawn and Gus are once again in New York, and Shawn stops by the White Collar office to say hi, finding himself unexpectedly face to face with none other than Neal Caffrey, now a CI for the FBI! Happy reunions are had, new friendships are made, and stories are told all around . . . but it appears that these friends aren’t the only old acquaintances in New York, and someone has ill intentions towards Shawn and Neal. These two stories are ones I’ve wanted to see a crossover fic for basically since I first discovered the shows. And DTS does a great job melding these stories in Psychic in the City. I love the way the author builds up this backstory, using a series of unrelated encounters that inevitably bring them all together in the end–the history and the time factor add a nice touch to the story. The author does a good job with the characters as well, although in some ways I wish they had been a bit more strongly characterized, if that makes any sense at all. Shawn and Neal are a lot alike, but they’re also really different, and although I can see them bonding over their similarities, I can also see them exasperated/baffled by their differences. But I guess I also like the idea of them finding someone in each other that they can be themselves with, sans all the acting and the fronts they both put up generally. What I’m trying to say is that, although the characterizations weren’t exactly what I expected or would have done myself, I liked them and found them to be credible and in-character–and what more can I ask than that? The plot was also interesting and entirely plausible for these guys, but warnings for a major cliffhanger ending. There’s a sequel, though, which will probably be reviewed here shortly. Psychic in the City is definitely a recommended story for those who enjoy these two shows. Note: You can find Psychic in the City at https://www.fanfiction.net/s/10162083/1/Psychic-in-the-City. In a small Welsh town where it rains nearly daily and nothing every really happens, Dylan finds himself the last boy anywhere near his age. So even a soccer game is out. Left keeping the petrol log for his family’s gas station/mechanic shop and avoiding the unwelcome attentions of “Terrible” Evans, it seems like nothing will ever change . . . until one day when a whole cavalcade of vans rumbles past their station, up the mountain, to the abandoned slate quarry. Suddenly, the town is abuzz with gossip. Perhaps even moreso when it becomes known that the contents of the National Gallery have been temporarily relocated to the quarry due to flooding. And somehow, the presence and exposure to the art there begins to change Dylan and his town . . . but will the changes all be for the good, or will Dylan and his siblings be inspired to more sinister designs? As always, Frank Cottrell Boyce delivers a home run of a story in Framed. The writing, the characters, the themes–it’s all brilliantly executed and very readable. I love the way he chooses a few motifs and uses them repeatedly to tie the story together and draw out deeper ideas in a way that’s relatable. Surprisingly, this is perhaps the most credible and realistic of his stories that I’ve read to date; most of them tend to be rather tall-tale like (or even just be absurd science fiction), but this story is something that–while improbably–could possibly actually happen. Which is actually pretty great, because this is a story of inspiration and positive change in the midst of darkness and stagnation. I love the art aspect of this story as well; in a lot of ways that aspect reminds me of E. L. Konigsburg’s books (she’s another favorite of mine!). All in all, Framed is a great middle-grade story which reaches way beyond its intended grade range–recommended for basically anyone! Seventeen-year-old Jasper Dent (better known as Jazz) did not have the most normal childhood. Actually, he was raised by his dad, a notorious serial killer–raised to think like and eventually become a killer himself. But now Jazz’s dad is behind bars and Jazz wants a different life for himself. So when the body count begins to rise in his small home town, Jazz decides to (unofficially and without the sheriff’s permission) assist with the investigation. Because he knows how the killer thinks. And to prove to the town that he’s not like his dad . . . only, is it the town or himself that he needs to convince? 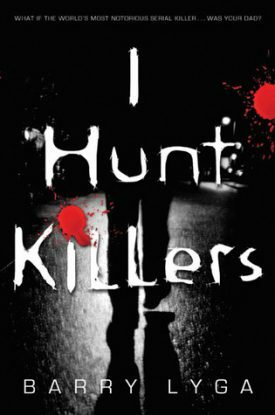 So, I’ve never read much Barry Lyga, but I Hunt Killers was an interesting enough read. It’s kind of a mashup of a contemporary YA novel and an adult crime thriller. And I guess that’s where I get my weird personal reactions to this story. Because on the one hand, I really enjoyed it, but on the other hand, it’s kind of strange and unsettling in a way I’m not sure I like. There’s this total dichotomy, even though in the book the elements are actually combined pretty well. On the crime thriller side, you get this guy who can get into the killer’s head, you get some pretty intense crime scenes, some very painfully intense flashbacks to the guys’ childhood, and a puzzling mystery that gradually unfolds. And on the YA side, you’ve got this kid who is struggling to even see himself as human, who struggles to see the people around him as human rather than just as things to be used. There is a ton of psychological and emotional baggage and internal conflict going on. And then you’ve got Jazz’s awesome girlfriend Connie and his BFF Howie–both of whom get dragged into the mess that Jazz involves himself in. The writing and the pacing of the story are good. The author clearly put a lot of research into this book. And I would read more of Barry Lyga’s books. I probably would read more of this series, even. But I still feel just a bit off about I Hunt Killers . . . but maybe that’s the intended results, because how can a book about a kid who was raised to be a serial killer ever really be okay? In his obsession with the writings of reclusive author John Rothstein (whom he considers a sell out), Morris Bellamy devises a plan to break into the old man’s house and exact his revenge. There’s also the tantalizing rumor that Rothstein has been writing in private and has volumes of unreleased work hidden somewhere in his home. Morris’s plan works, and he gets away clean, burying dozens of Moleskine notebooks full of Rothstein’s writing as well as several thousand dollars in cash that Rothstein also kept in his safe . . . only to find himself imprisoned for life on other charges before he gets to read a single one of those notebooks. Decades later, thirteen-year-old Pete Saubers finds Morris’s buried treasure by accident. And who could fault a kid for secretly passing the money along to his struggling parents, bit by bit–or for obsessively reading the Rothstein notebooks, fueling an already burning passion for literature. But things get messy when Morris is released from prison and comes looking for what he buried (what he killed for) so long ago. I have found every Stephen King book I’ve read so far to be quite enjoyable, including Finders Keepers. Having said that, I think King does his best work when there’s something paranormal involved. This book is more of a crime thriller, and while it’s still quite excellent, it’s not his best in my personal opinion. I should note that this is the middle volume of a loosely connected trilogy (preceded by Mr. Mercedes and followed by End of Watch), but it’s entirely possible to read it independently (I did) without missing much; all the background you really need is worked into the plot. I thought the characters were solid enough, although I never strongly connected with any of them–Pete and Holly were probably the closest I came, but even they weren’t particularly immediate to me. The plot was fairly interesting though, all of the seemingly disconnected pieces fitting together like a puzzle. As far as the pacing goes, this is a fairly slow-burn thriller, if that makes any sense at all. There’s definitely action, suspense, and intensity, but as far as the story chronology goes, it takes decades to build, and for the reader, it takes place over several hundred pages. I wouldn’t plan to read the whole thing through in one night, that’s all. It never got boring or stalled out though, at least not for me. Fair warning that, since one of the characters is a murderer and a convict, this book has more than its fair share of violence and language, so don’t come complaining to me if it’s shocking. Just saying. One of the most fascinating aspects of Finders Keepers for me was the obsession the characters had with Rothstein’s story; that’s something I can sort of relate to, and it’s also a good warning. I think most of us can agree that Bellamy is just stark raving mad, completely losing sight of the boundaries between fiction and reality. The greater warning is Pete’s story, that fine wavering of those boundaries that we can explain away logically while still doing nutty things to feed our obsessions, losing sight of what’s really important–like the people we care about. 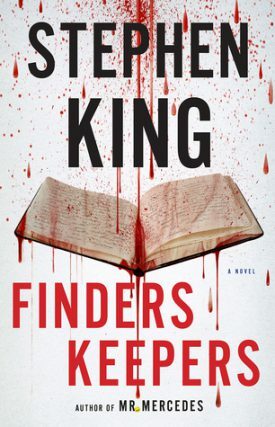 In any case, although it’s not my favorite of King’s books, I still think Finders Keepers is a good read, especially for those who enjoy the crime genre. On his one-hundredth birthday, Allan Karlsson finds himself in a nursing home with a big party planned in his honor. If only they had deigned to ask what he wanted! Allan would much rather have a bottle of vodka to enjoy–something that is, in fact, forbidden in the home. In that case, it’s time to stop sitting around. Allan climbs out the window of his room and embarks on quite the adventure, one including murder and elephants and, of course, vodka. Not that it will be the first adventure of his long life. 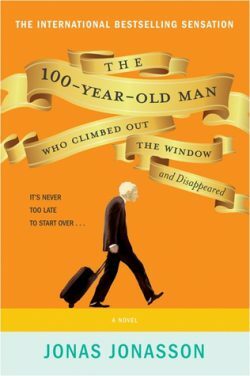 I first discovered The 100-Year-Old Man Who Climbed Out the Window and Disappeared through a review by Paul@The Galaxial Word (which you should check out; it’s excellent). It seems that this is a book which inspires rather polarized opinions in either direction. Personally, I enjoyed it, but I think you have to come at it with the right expectations. Because this book is, essentially, an extended tall tale, a larger than life story that’s meant to be fun and funny but that can’t be taken too seriously. The humor is rather dark, I must warn; there’s some violence (actually, quite a bit) scattered throughout the story as well. I found that, while I didn’t exactly like the characters, they were interesting and they all contributed to the story. As for the plot, it’s a fascinating blend. Half of the time, you get a present-day romp through contemporary Sweden with this old man and the people he picks up along the way sending the police and the papers on a merry chase. The other half, scattered between the present-day chapters, is a historical progression through Karlsson’s long and storied life. It shows his intimate involvement–brought about by his coincidental presence in most circumstances–in numerous high-profile situations throughout the years. Obviously, such involvement is highly improbable and historically unlikely (a common complaint that I’ve heard). Duh. It’s a tall tale; it’s meant to be improbable and unlikely. I did enjoy the close-up walkthrough of those historical events though. I guess what I’m getting at is that, while it’s not for everyone, I personally found The 100-Year-Old Man Who Climbed Out the Window and Disappeared to be enjoyable, and I’m planning to check out others of the author’s books (which all seem to be just as ridiculously titled! ).